(Newser) – Ruth Bader Ginsburg has been home for more than two weeks recuperating from surgery that removed two cancerous growths on her lung. This has sparked a swirl of speculation about the 85-year-old Supreme Court justice's health, especially after she missed oral arguments Monday, the first time in her 25-year tenure she'd done so. On Friday, some good news for Ginsburg, per NPR: She has no more signs of cancer and won't need any more treatment, per a court statement. 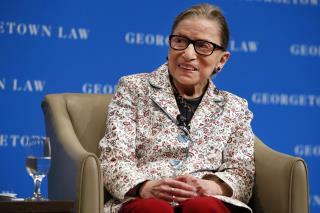 "Her recovery from surgery is on track," a court spokeswoman says. Futurama has a jar ready for her head. They need to give her a competency test before they let her back. Check for dementia while you're at it. Then again. She doesn't need to come back to vote. We already know how she will vote. The same way she always votes. Liberal!